Summary When he thinks his hamster Abu has just a week to live, Harry Hill and his gran take the hamster on a trip to Blackpool. 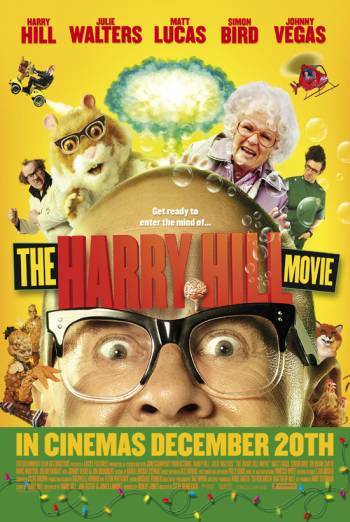 THE HARRY HILL MOVIE is a comedy in which Harry Hill must protect his pet hamster from villains. Violence includes Hill taking part in a boxing match in which he is punched in slow motion and in slapstick style. In another scene Hill's grandmother uses a comic style of fighting, which involves some slapstick moves, such as pulling on a man's tongue before letting it slap back. No one is seen to come to harm in any of these comic scenes. In one sequence Hill's pet hamster is turned into a giant creature and is shot at by soldiers, resulting in small explosions on the giant hamster's body. But no harm comes to the hamster who soon returns to his normal size. When the villains try to capture the hamster they rummage around under some bed clothes as one comments "I’ve got my hand on something furry". They are discovered in the bed together and, as they are dressed as a priest and a nun, Hill disapprovingly comments "you people took a vow". There is also a reference to strip-o-grams and the possibility of finding some "curlies" on a bed in a B&B. Hill's grandmother is seen drinking petrol from a can and then burping flames. But she is told off for this behaviour. There are also jokes about farting and, in one scene, the hamster vomits green slime over several people’s faces.